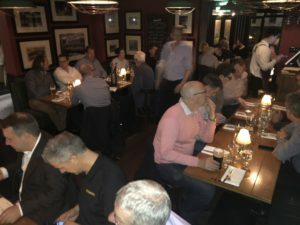 In conjunction with the World Demolition Awards being held at the Aviva Stadium in Dublin on the following evening Wednesday 07 November saw the latest IDE Regional Meeting held at The Ballsbridge Hotel in Dublin. Organiser Adrian McLean FIDE of Armac Group invited IDE members to join Demolition Engineers, from around the World who were attending the Awards event, at the meeting to discuss all things demolition related as well as listening to presentations on bridge removal, top down demolition, health & safety issues and explosive demolition. IDE President David Darsey FIDE thanked the sponsors, ECY Haulmark, Worsley Plant and Rammer/Murray Plant before welcoming over 40 delegates to the meeting and said he was delighted to see guests from Australia and Canada in the room, before apologising for changes to the event as original speakers were now unable to attend. David then introduced the first presentation of the afternoon by Eamonn McCormack MIDE who gave an excellent talk about a recent project at Metropolitan College, Belfast which started out as a standard “top down” demolition but quickly changed as work progressed when structural issues were found within the building that forced a complete rethink and a major change of method. Next up was John Woodward FIDE who gave a brief talk about “Hidden Killers” including Asbestos, Silica, Lead, Anthrax, Aspergillus and Nano Particles. The mention of Aspergillus lead to some discussion in the room about the type of structures that could contain Aspergillus spores and how people with a low immune system could be seriously affected and there was some surprise that the spores kill over 4000 people a year in the UK. The final section on Nano Particles also lead to discussion with Dr. Terry Quarmby FIDE giving an excellent insight into how the particles are currently used and what issues may occur with them during demolition in the future. Ryan Priestly from Priestly Demolition in Canada then stood up to talk about their contract to demolish Port Hope Bridge in Ontario that was shortlisted in the World Demolition Awards Civils category on the following day. The excellent video used in the presentation included news footage from the bridge failure and extensive footage of the actual demolition using large machines and attachments to achieve a successful outcome. Following the video Ryan took questions from the floor about working on the project and in Canada. David Darsey then thanked Ryan for taking the time to both attend the IDE meeting and to deliver such a quality presentation. Dr. Terry Quarmby then took a few minutes to outline how IDE have moved forward over the last few years with education of demolition managers and engineers with the introduction of the MSc in Demolition Management in conjunction with The University of Wolverhampton and now the Foundation Degree delivered by IDE on a monthly basis in a format agreed and endorsed by the University that will see our profession elevated to a higher education level giving ever more credibility to the industry and demolition practitioners. 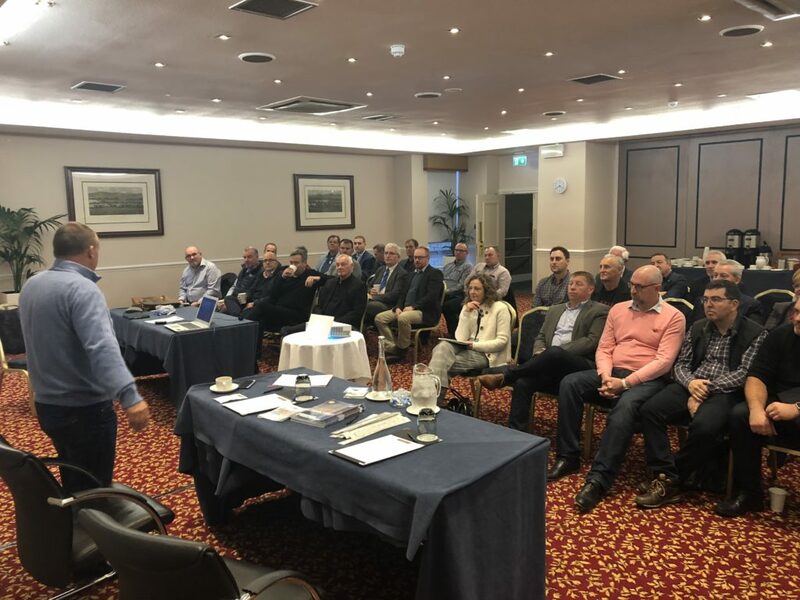 Terry encouraged IDE members to enrol on the fully funded Foundation Degree before taking questions from the floor as to how to enrol and, whether the Foundation Degree can be done by distance learning to allow interested parties from around the World to take up places on the course. Terry stated that as now there is no distance learning option but he fully expected that to become an option over the next few years. The final presentation of the afternoon saw John Woodward return to talk about 13 years of demolition of towerblocks in Glasgow using high reach, top down, “Top Down Way” and explosives with the presentation ending with demolition featured in a Hollywood film as John played the closing credits of “Trainspotting Two” that has the credits rolling over black and white footage of the Glasgow explosive demolitions of those 13 years. David Darsey thanked the sponsors again and the presenters before Adrian invited everyone to join him later that evening after the Awards Cocktail Reception at FX Buckley steakhouse where over 40 people enjoyed great food, Guinness and demolition chat until the early hours. C&D Demolition Consultants Ltd and C&D Consultancy.